Mallory Sea from Sioux City, Iowa will complete a Masters in Marine Science in shellfish restoration focus on the spatial distribution of sub-tidal mussels in the Hauraki Gulf at the University of Auckland. 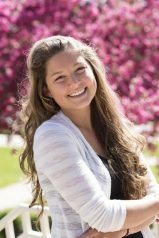 Mallory graduated with a BS in Biology and a BA in Chemistry from Morningside College in 2016. Read more about Mallory’s adventures at the One Ocean Conference here.